Many homeowners are concerned about the hardness of their water. What is hard water though and is it really something to consider? Hardness is caused by compounds of calcium and magnesium, and by a variety of other metals. General guidelines for classification of waters are: 0 to 60 mg/L (milligrams per liter) as calcium carbonate is classified as soft; 61 to 120 mg/L as moderately hard; 121 to 180 mg/L as hard; and more than 180 mg/L as very hard. Shower heads and faucets have a buildup on them that is white and/or green. This can be incredibly annoying, unsightly and difficult to remove constantly. This build up can damage the finish on your fixtures and reduce the flow of your faucets and shower valves as well as cause them to spray in the wrong direction. Dry skin can actually be a symptom of hard water. Hard water can make it difficult to remove soap film from you skin leaving a residue that leaves your skin feeling dry. Having to use more soap to clean your laundry. Hard water requires more detergent to get the job done. 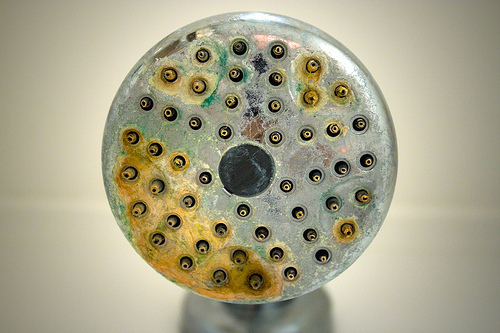 Spotted dishes and shower doors are a pesky side effect of hard water. Hard water spots left unchecked can etch shower doors damaging them permanently, requiring them to be replaced. Hard water also builds up inside water heaters dramatically shortening the lifespan of your water heater and other plumbing fixtures. Water softening systems such as the ones provided by Robins Plumbing can protect your largest investment; your home. Water treatment is important here in the Phoenix area, and there are several options. Robins plumbing offers traditional salt or potassium systems, Citrus systems, whole house conditioners, reverse osmosis systems, reverse osmosis filter changes, point of use systems, water conditioners, etc. We can help you pick the water treatment system that works with your lifestyle and budget. Give us a call today to schedule one of our professionals to provide you with a free water analysis, and free estimate.